Mike Moore | The Journal Gazette Mastodons guard John Konchar attempts to block a shot made by North Dakota State guard Paul Miller in the first half at Memorial Coliseum on Saturday. 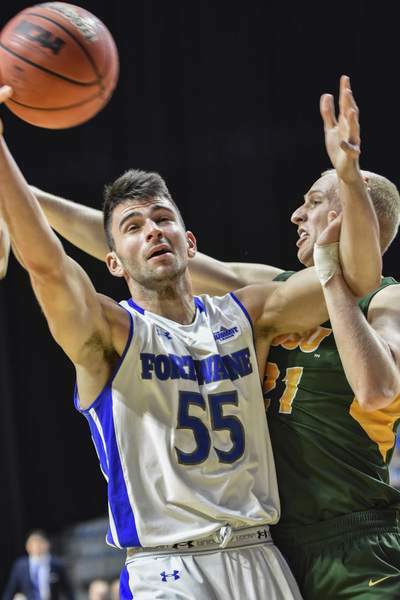 Mike Moore | The Journal Gazette IPFW guard John Konchar and North Dakota State guard A.J. Jacobson fight for possession of the ball in the first half Saturday at Memorial Coliseum. Mike Moore | The Journal Gazette IPFW guard Kason Harrell drives to the basket during the first half Saturday against North Dakota State. Harrell finished with 26 points. IPFW surged ahead in the second half to win 92-88 over North Dakota State at Memorial Coliseum on Saturday. A buzzer-beating 3 from Kason Harrell at halftime served as an omen of things to come in the second half; Harrell made 6 of 10 3-pointers on his way to 26 points. Down 51-40 at the break, the Mastodons (14-9, 3-3 Summit League) opened the second half with a 17-9 run and trailed just 60-57 about six minutes in. A pair of free throws from Bryson Scott with 9:18 left tied the game at 72, but the Mastodons did not take a lead until a Scott layup made it 84-83 with 2:39 left. Over the final four minutes, the Mastodons outscored the Bison 13-5, including making 11 of 12 free throws. “We shot 56 percent from the floor in the first half,” coach Jon Coffman said. “Our guys were engaged, but North Dakota State was better in the first half. They shot 67 percent. How many plays did (the Bison’s) Paul Miller make with a contested hand in his face and just drain, drain, drain? Miller finished with 21 points. 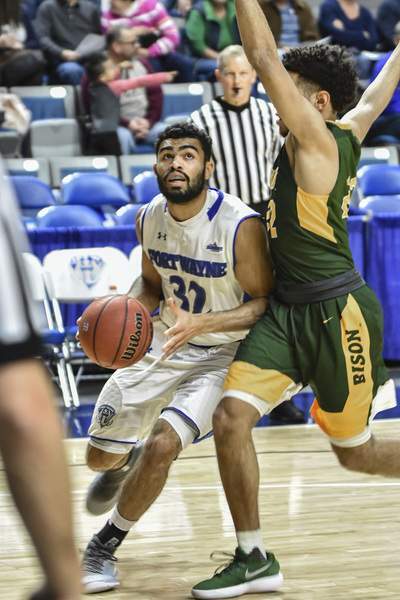 IPFW held North Dakota State (10-10, 2-3) to 12 of 32 (41 percent) from the field and 5 of 17 (29 percent) from 3 in the second half. 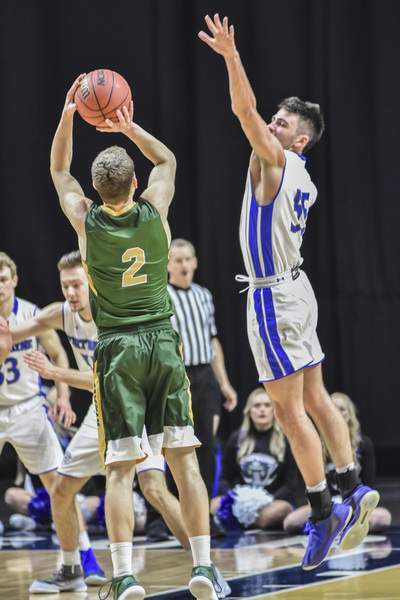 The Mastodons also scored nine points off seven turnovers. “I think our urgency increased and we focused on our principles in terms of flooding ball-side,” Coffman said. “We did a better job with that but … their offense is a very generic offense in terms of the ball-screen continuity that a lot of teams in the country guard it. We’ve had a way to guard it every time we face it. We made some adjustments and guarded more with our principles so we kept the ball on the side better in the second half. A.J. Jacobson added 21 points for the Bison, and Tyson Ward added 12.